I used to have an electric percolator, eons ago, before drip pots were all the rage. Now drip pots are the standard in coffee makers. It's hard to find anything else. I reckon it was the newness of it (why are we humans always so enamoured with the latest in gadgetry? ), plus the promise of faster coffee? There was a box of junk left here when we first moved in, and inside the box was that stovetop percolator. Finally this winter we decided to give it a try. It took a little experimenting, but oh my goodness, if you're a coffee drinker there is no better coffee in the world. The coffee is rich, hearty, and hot. My drip coffee machine doesn't do that. And the second best coffee in the world? Coffee made in a coffee press. Do they still call them French coffee presses? That's what it was called when I got my first one, eons ago, when we were preparing for Y2K.. We have two now, one that makes two or three cups, and the one above, a one cup model. With wood heat, we almost always have a kettle on, so hot water is available. We've found 10 minutes of perking to be good for us with the percolator. Pressed coffee takes less time than that, only a couple of minutes. It's the closest thing to instant-gratification coffee we have. The press could be used for loose tea too. We only use these in the winter, as a non-electric way to make coffee. In summer, it's back to the drip machine. We don't actually drink a lot of coffee, however. A cup in the morning and a cup after dinner usually. But it's nice to have good coffee to drink. How about you? What's your favorite cold weather beverage? At the end of tomato season last summer, I found myself tossing most of the ripe tomatoes into bags in the freezer. Bags of whole tomatoes have been keeping in my freezer since last summer. I've been doing this anyway, because freezing makes them easier to peel. After I canned pizza sauce, tomatoes & okra, and chevon gumbo, I saved them because I wasn't sure what to do with them next. I took inventory a couple of days ago, noting I had plenty of everything, almost. What I was running low on, was canned tomato soup. With a winter storm approaching, making and canning more seemed the perfect indoor activity. Cooking down the tomatoes with onions and celery. The recipe I use is a modified one from Chiot's Run. When I first started researching canning tomato soup, I discovered there was a lot of controversy about it. Many folks can a condensed soup using a butter and flour base for the cream sauce. According to the USDA, this practice is not safe, something about the fat possibly coating botulism spores so that they can survive even pressure canning. So the camp was divided, some folks having canned creamed tomato soup for decades, others afraid of it. While science often holds sway, so much of it nowadays, at least when it comes to food, favors big business. Unfortunately, when research obliges whomever foots the bill, science loses credibility over the long run. This is a new kitchen tool for me; I love it! Much faster than my little Foley! Initially I was looking for a Squeezo, but that brand is out of my price range. All that said, I decided to forego the cream base before canning, plus I pressure can my soup because I make it with onions and celery. I have found it just as easy to make the cream base when I heat the soup. cream sauce, or used as juice or an ingredient for a stew, gravy, or casserole. Wash and sterilize canning jars. Fill jars leaving 1/4 inch headroom. Add salt (if you didn't before). Adjust lids. Process in pressure canner as per Ball Blue Book's recommendation for tomatoes and celery: 30 minutes per pint, 35 minutes per quart. Yield: 13 pints. forget or have to look them up later. 1 jar of soup, whisking to smooth out lumps. 1 jar of your choice of liquid. I use milk & water (50/50 because Ziggy's milk is so rich), or stock. I don't know about you, but Campbell's tomato soup was comfort food when I was a kid. I remember well, visiting my grandmother and being served lunch: tomato soup, a grilled cheese sandwich, and a dish of canned pears on a tray in front of the TV so I could watch Bozo the Clown. Now I eat my homegrown, homemade, home canned tomato soup with grilled cheese sandwiches using homemade bread and butter, and my own homestead goat milk cheese. No pears yet, but hopefully I'll have some to can in a couple of years. This cream of tomato soup is so much better than Campbell's, but the comfort factor isn't diminished one bit. Good memories with an even healthier, tastier tomato soup. The best of both worlds. Why is this a news flash? Because this was laid by the chicken that hadn't laid in forever, AKA My personal chicken. I can't even remember the last time she gave me an egg; way before moulting season. I didn't think she was spent, because her sister is still laying. She does have a tendency to hide her eggs, but I've kept an eye on her and have never found a stash. Unless, she's been eating them (a bone chilling thought). I have missed those green eggs though, so I hope to see a lot more of them in the days to come. Last October I blogged about my cowpea sheller. Here is another tool I've been wanting to show you; our new corn sheller. It's not an antique, it's new. I first found manual corn shellers in a Lehman's catalogue, but I purchased ours from Pleasant Hill Grain. It is cast iron and very heavy. We were stumped setting it up for the first time, because we didn't expect the crank to be on the opposite side of the clamps. We clamped it to a board, which is secured to saw horses with c-clamps. I put a plastic tray underneath to catch any wayward corn kernels. Corn still flew so Dan suggested slipping an old feed bag under the clamps as well. This worked well and the bag caught most of it. The action of the sheller is extremely clever I think. As the shelling wheel is turned with the crank, the teeth on the wheel remove the kernels and rotate the cob as it moves downward. ... where it's easily caught and tossed aside. It's not very easy to explain, so I found a video on YouTube. It shows the process in motion with a sheller similar to mine.You can view that video here. Experimentation taught me that it works best for medium to large size ears. I can't say I get it 100% of the time, but I can say it makes quick work of an otherwise tedious job. Definitely worth it's purchase price! Stray kernel clean-up service was provided by my personal chicken. production of the chemical furfural, which can be further made into stockfeed, flavoring, herbicides, a chemical solvent, a wetting agent, and in the manufacture of abrasive wheels, brake linings and refractory products. shredded as livestock and pet bedding for small caged animals such as hamsters, guinea pigs, etc. I'm not sure which of these need fresh corn cobs, or which can use dried.The last three or four I would be interested in trying as we work toward a no waste way of life. About five pounds of the shelled corn was saved for seed, a gallon jar full was added to in the freezer for making corn meal, and the rest is for the chickens. Short bits, updates, and other odds and ends since my last Around The Homestead. ~ I always count my chickens before I close up the hen house for the night, but I never think to count them in the morning. If 12 chickens went to roost, then 12 chickens will show up for morning scratch. 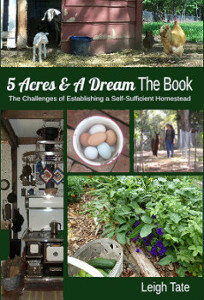 One morning I was busy with the goats while all the chickens were busy in the chicken yard, or so I thought. When I heard a chicken fuss in the coop, I went to investigate. There, hanging upside down from the top roost, was one of my Welsummers! Pegs hold the roosting bars, and she had somehow gotten her foot caught between the peg and bar, and ended up hanging upside down! After an immediate rescue, she was no worse for the wear, but I have to say I never saw that one coming. ~ Actually, we are down to 11 chickens. Junior, formerly known as Chicken Little, turned out to be a real rabble-rouser. 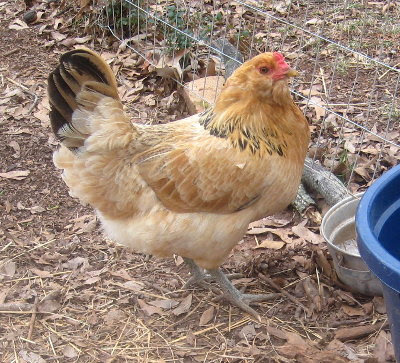 Once he matured, there was constant chaos in the chicken yard, indeed, on the entire homestead. He was forever chasing the hens who were forever running away. When Cowboy wasn't chasing him, there were constant crowing wars. Junior would ambush the hens, even in the hen house, so that they wouldn't go in to lay their eggs. One interesting observation was that the hen being chased would always run to Cowboy. When she got within a foot of him she would stop and look at Junior as if to say "Safe!" One day when it was particularly bad I asked Dan if he'd like rooster for dinner. We did the deed and peace and calm immediately descended upon the entire homestead. I'd like to think we gave him a good life, but he and his own kind made that impossible. ~ I'm pleased with how the new pasture is growing. We haven't let the goats in yet, because the growth is still tender and the ground soft from all the rain we've had this winter. ~ I've had a second cheese worth trying again! Cheese #12. It does have some things in common with Cheese #11, my first repeatable cheese. Both were cultured with the whey from the previous cheese, and both were brined. That may be a technique to use with all my hard cheeses. 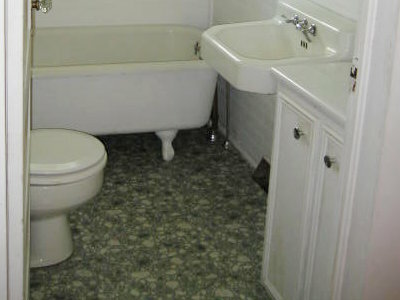 ~ The next step in the bathroom remodel is refinishing the clawfoot tub. That's it pictured above, upside-down in the hallway, where the temperature is better for priming and painting. The claw feet have been removed for refinishing. The outside will be sanded and painted first. Dan bought a tub refinishing kit for the inside. We've been working outdoors though, while the weather is nice, so it may be awhile before he gets this done. ~ I'm finding that my 365 Days of Independent Eating self-challenge to be helpful. I'm still working out the details of what to record, but I'm finding it motivating. I did less in the garden last year because of the kitchen remodel. This year I plan be more consistent and more proactive with it. 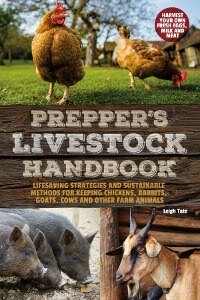 It made it to my 2013 Homestead Goal list for that reason. And, I reckon that's it. Yesterday as I went out to let the chickens out to free range, I heard Elvis calling at me. I looked and saw him standing over by the gate to the buck pasture. I called his name and he answered. He didn't move so I thought I'd better go take a look. He had his head stuck in the cattle panel I put up to keep the boys back from getting too close to the girls. Elvis likes to sneak into this little closed off area to scarf down acorns. The day before I'd secured the gate, cattle panel, and a corral panel so he couldn't do that anymore. I'd had this happen before with Abigail, one of our first goats. She also had horns. She used to get her head stuck in our cattle panel hay feeder. I was always able to work her head out, but Elvis was a different matter. I could not turn his head and horns to back him out because both are so big. He must have gone in nose first, but the opening was too small to turn his head to maneuver it nose out. Step two was to get out the hack saw. I sawed the panel with a hack saw to free his head. My only "problem" here was Gruffy, who insisted on pulling on my jacket, my sweat pants, and my braid, and on untying my shoelaces. It didn't take long though, before Elvis was freed. Elvis afterwards, no worse for the wear. I have to say he was a real trooper. He didn't panic, but waited patiently for me to help him. He's only allowed himself to be touched or petted briefly, but let me handle him and was as cooperative as he could be considering the situation. Even though the meat breeds are not traditionally disbudded, this is one reason why I'm not real keen on my goats having horns. Dan and I disagree about this, he likes horns and thinks disbudding is cruel. I can't help but think though, what would have happened if a predator had found Elvis like this. As far as I know, we don't have coyotes in the area, but we do have stray dogs and had the neighbor's dog jump the fence to chase the goats and chickens. Disbudding though, is not exactly a pleasant affair and I would never have any goat dehorned. Disbudding = burning the horn bud with a disbudding iron before the horn starts to grow. Dehorning = removal of horns after they are grown. Anyway, all's well that ends well. I gave Elvis a drink of water for his ordeal and he ate a few acorns from my hand. After that it was goat business as usual. Last week's renderings half filled a gallon crock with cracklings. Over the weekend I made cracklin cornbread. It was the best cornbread ever! I used my basic Southern cornbread recipe, but had a question of how much cracklins to add. The Little House Cookbook and a few other recipes called for a timid couple of tablespoons. That didn't seem like enough so I kept looking. Finally I found several recipes calling for one cup, which seemed more like it. Pour batter into piping hot skillet. Bake until golden brown, about 25 minutes. Serve hot. Fat - Obviously you can use whatever fat or oil that suits your fancy. Some recipes call for adding the melted fat to the batter before pouring it into the skillet. I don't do this, I just pour in the batter without adding the fat. The result is a delightfully crispy edged cornbread, almost like it's been fried. Leavening - Many (most) cornbread recipes call for both baking soda and baking powder. Baking powder contains baking soda (the base) and cream of tartar (the acid) buffered with cornstarch, to slow down their reaction to one another. It's the chemical reaction between the base and acid that cause batter to rise. I quit using baking powder awhile ago because I always have an acidic liquid on hand: buttermilk, whey, yogurt, or kefir. I've even used a dash of the liquid from lacto-fermented veggies, like sauerkraut. For that reason, I don't need the baking powder and can skip it. Except for the baking soda and salt, this is easily made with 100% homegrown ingredients. We ate ours with a big bowl of home canned tomatoes and okra mixed with leftover homegrown black turtle beans. I put fresh Ziggy butter on the table, but the cornbread really didn't need it. When we first moved into our house, the floor in the hall bathroom was vinyl. The bathroom as we first saw it. It was poorly installed and the edges were all curling, which were strikes against it. We also knew that the toilet had been leaking and suspecting water damage, Dan pulled the vinyl out. glued to the floor. Hidden under it, was an older linoleum floor. Under that was a linoleum floor and under that, the original oak tongue and groove floor, complete with water damage from a previous plumbing leak. Repairing the damage was quite a project; details here, "Fixing The Bathroom Floor". The next step was to lay down Hardibacker Board. It was adhered with thinset and screws. The most sensible flooring would have been a new sheet of vinyl. Dan, however, does not like vinyl floors. Wood was out, so that left tile. If we had been in our right senses, we would have chosen all one size, either the 6" or the 12". It still would have required some cutting, because the room is smaller than a full layout, but it might have been a tad easier to deal with. Holes had to be drilled in the tile for all the plumbing. Two sizes of tile, plus layment pattern, plus cutting, plus drilling holes for the plumbing, all made it a very fiddly project! Definitely more challenging than installing the tile in the kitchen bathroom. Tile laid and ready for a sealer. I think it turned out really well, though for some reason it was difficult to photograph. It still needs to be sealed and then the baseboards.